This theme provides a sleek and elegant template perfect to create professional website with ease. Built-in mega menu, 12 column layouts, contact form with custom fields, custom posts like video, gallery, portfolio, slider and more, makes it very easy to categorize your content and showcase it in a beautiful way. Itâ€™s a retina ready (high definition) markup and settings coupled with unlimited color options, beautiful social sharing options, carefully crafted elements create a perfect and harmonious website for you, making it the perfect choice from a simple blog to a big, content heavy recipe website. 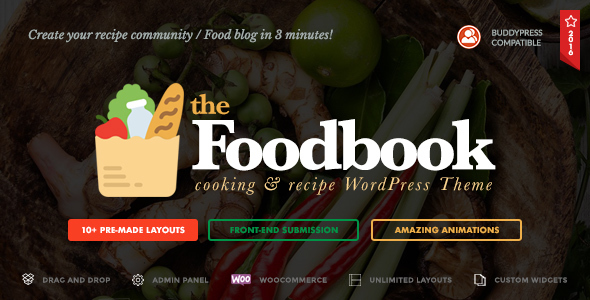 It is fully translatable and WPML ready, 5 included sliders that can showcase posts, galleries, videos or custom slides, and fully responsive down to mobile plus 14 different gallery styles â€“ Foodbook is a premium theme that brings your website to a new level. Thinking about upgrading your current photography theme? Or youâ€™re interested in changing the style of your photo website? Foodbook is surely a product to take into consideration, as it provides the perfect balance and packs such extraordinary options and layouts. Content is important, and your sidebars might have very important content indeed. Even advertising can get sticky so that you get more clicks on your banners. Itâ€™s easy and simple to do. Whatâ€™s to impress here? Left or right sidebars are available for video posts as well as for simple blog posts, making it a walk in the park you create a cool looking layout. UNLIMITED layouts. Enough said. Our builder gives you the opportunity to change anything. It includes lots of elements that you can arrange to suit your needs. As the website uses the 12 columns Twitter Bootstrap setup, itâ€™s easy to manage your content through columns. Any element can have from 2 to 12 columns. 5 styles of listing posts, with tons of options for each type. And the important thing â€“ ITâ€™S EASY. Itâ€™s not an additional plugin â€“ it stands at this themeâ€™s core and it works blazingly fast! Everything is well made and documented. Just like the header â€“ you have unlimited layouts. No restrictions, change the footer as you think it will look better. Your website, your rules. Demo content comes with the package. Just download the theme and youâ€™ll get all the demo content included.